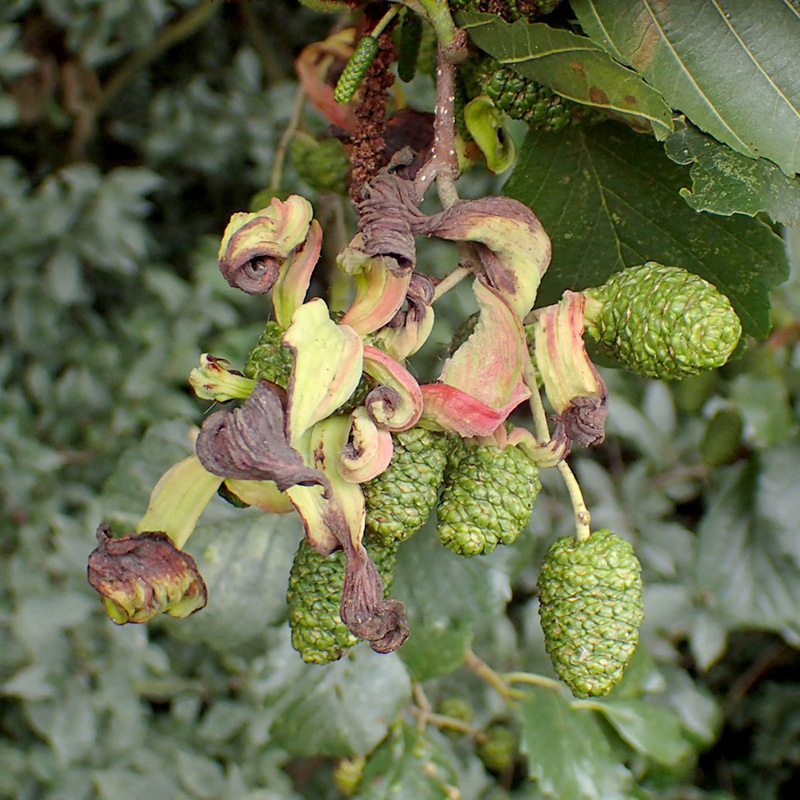 This fungal pathogen causes alder tongue gall, a chemically induced distortion of fresh female alder catkins. The alder tongue gall is a strange but conspicuous tongue-like growth on the catkins, green at first, later turning yellow, orange, red or purple, and eventually brown or black. Once rare in the UK, alder tongue is spreading and is now quite common. Alder cones may carry one gall or several, usually emerging from the same spot on the catkin. The galls mature on the catkins eventually releasing their spores into the wind to infect neighbouring trees. The tree host, alder (Alnus glutinosa), is found on moist ground near rivers, ponds and lakes and can grow up to 20m tall. It has dark, fissured bark which is often covered in lichen. Its round, dark green leaves are largely hairless and have serrated edges, and the tips are often indented. The flowers form on catkins between February and April before the leaves appear. Male catkins are long (2-6cm), thin, yellow and pendulous; whilst the female catkins are green, egg-shaped, measure around 1cm long and are found in groups of 3-8 on each stalk. Once pollinated by wind, the female catkins gradually become brown and woody and look like small pine-cones which house the seeds. In winter, the cones open up and release the seeds which are dispersed by wind and water. Locate the host plant, alder. It often grows in moist ground near waterbodies but will also grow in drier locations. Galls form on the egg-shaped female catkins, not the male ones, which are long and dangle down. Alder tongue galls can be seen all through the year but are more brightly coloured earlier in the season.